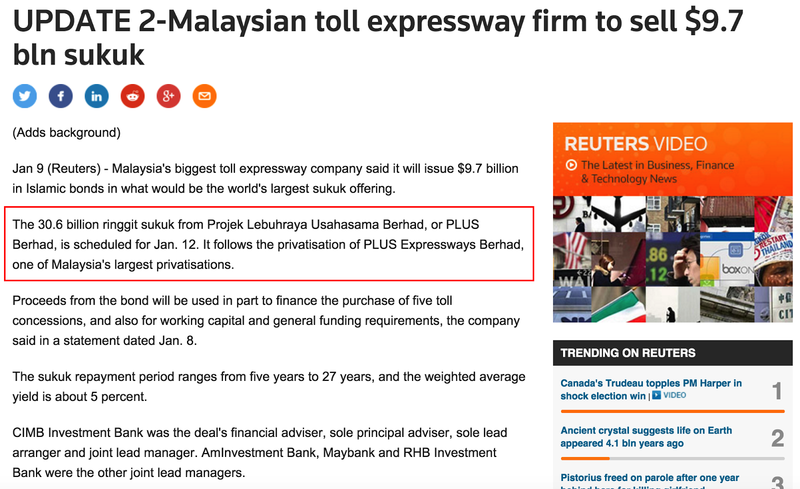 SERIOUS Investing: Stopping PLUS toll collection - REALLY? Stopping PLUS toll collection - REALLY? I am hearing from Lim Guan Eng that he can eliminate the toll for PLUS based on the youtube video below. Not so easy. PLUS has RM30 billion debt. Who is going to pay off that debt? EPF owns 49% of PLUS while Khazanah owns remaining 51% of it. Is the government going to pay off that debt for PLUS? Agree on the return for PLUS but I do not think one can so easily dismantle the debt issue. To be frank, it was actually a very smart move by all the parties involved in the privatisation of PLUS. It is structured in a way where if we are to stop the toll or soften the price hike, it will affect the EPF contributor's pockets - i.e. yours and mine. Damn if you do, damn if you don't. They are quite smart people out there structuring this deal! In restructuring to take tolls out of PLUS, one will definitely need to obtain the approval from the bond holders. Easy? Nope. Otherwise, they would need to find RM30 billion to pay the bondholders off. Based on the principal amount of RM30.6 billion debt and at weighted average yield of 5%, its interest is more than RM1.5 billion/year. Ever wonder how it can be barely profitable? Huge interest costs of course. So now on investments - with its ability to fund a RM30 billion debt, do you know what is PLUS cash generation capacity? HUGE! Interest payment alone is going to be around RM25.4 billion. Total repayment including interest over the 27 years is going to be about RM56.2 billion. That's how much the banks think PLUS can generate free cashflow over the 27 years from 2012 to 2038, at the very least. This comes to on average more than RM2 billion a year. no more, it had since been privatised and now owned by Khazanah (51%) and EPF (49%). Delisted in 2011, with purchase at RM23 billion. Debt is way too high now and probably cash raised from the bonds already spent. UMA - Don't you think is a waste of time?